Last month, we introduced a new series called "Caterer's Choice" where we have teamed up with Chef Bryan Clark, executive chef for Joel Catering and Events. Each month, Chef Bryan will be offering up some delicious recipes and additional food trends to give couples a plethora of ideas when it comes to engagement parties, reception options or just a lovely date night in for two. Today, Chef Bryan brings us a New Orleans staple: fried seafood. "It doesn’t matter what your religious faith is, because the Lenten season means fried seafood in New Orleans," says Chef Bryan. 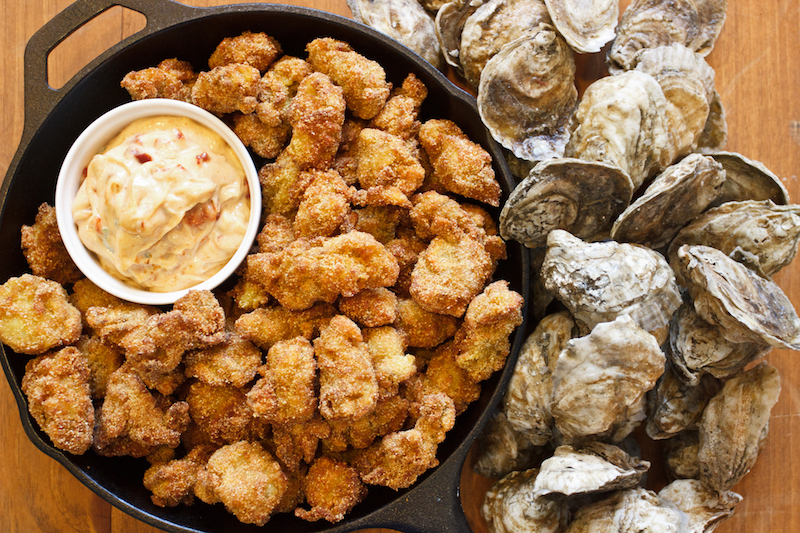 "On Fridays, we go searching for the best fish fry, or head over to our favorite seafood restaurant for fried oysters, shrimp, and crawfish tails. But a third option is the backyard fry party; and it fits in nicely with our need to get out and celebrate warmer weather with friends and family. It’s not hard to do and with some good ingredients, you’ll be hosting a New Orleans tradition in your backyard." Chef Bryan has prepared everything you could need for your own fry station, from safety precautions to the ingredients you'll need. The fry station is an excellent option for a springtime engagement party or couple's shower. Use a fryer such as this and make sure to follow the directions. When you're finished frying, wait for the oil to cool and use a funnel to return it to its container. If the oil isn’t too dirty, you can reuse it. Clear frying oil: Select a good frying oil such as a peanut and soybean blend.